This really is going back a bit. I came across these books in January, which proved to be an odd month for reading: I had plenty of time for it, but little mental capacity. I was either waiting around at airports, wiling away transatlantic flights with a flimsy attention span, or wilting after intellectually intense days of training. In short, I needed good, solid entertainment and by chance I unearthed a series that was just the ticket: Christian Cameron’s Long War books. The primary appeal was that the series focuses on the Greco-Persian wars. As you know I’ve been eagerly looking out for fiction dealing with that period. I bought the first book, Killer of Men, last last year and enjoyed it over the Christmas holidays, so was keen to read more of the story. After four books in a row, I confess my interest has petered out slightly but, even if it just serves as a reading log, I wanted to say a few words about the novels I’ve read so far. In flavour, these began reminding me very strongly of Bernard Cornwell’s Uhtred series, although personally I find Arimnestos of Plataea a more interesting and charismatic hero. You’ve got to give the cover credit for making its point clearly and simply, but it doesn’t really do justice to the story. This is the typical kind of ‘historical fiction for men’ design: a wild landscape, with a single object (sword, spear, shield, helmet) given centre-stage. The title threatened a thuggish, violent, blood-drenched sort of story, but fortunately it was a bit more than battle, grunting and generalised pillage. In fact, I thought it was really very good. I loved the narrative voice: old Arimnestos is telling his life story to his young daughter and her friends, among whom is a young writer from Halicarnassus, which made me smile. Arimnestos’ tale opens with his boyhood in modest but proud Plataea, training with his bronze-smith father and learning letters and weaponry from the old priest up on the hill. But the clouds gather: as his family grows wealthier, a feud develops and festers. It marks Arimnestos’ own fate when, after one of his first battles, he comes round to find himself sold into slavery and bound for the luxurious cities on the Ionian coast. Here he grows to manhood as a privileged slave in a wealthy household in Ephesus, making friends with his young master Archilogos and pining after Archi’s sister Briseis. And he just happens to be in Ephesus at a crucial time, round about the late 490s BC, when the Ionian Greeks are growing tired of their Persian overlords and things are about to start getting very interesting indeed. Yes, Ionia was a Persian satrapy. And that, of course, was what really captured my attention. I learned a lot about the Ionian revolt but also about the fact that it grew out of a long period of peace, stability and relatively low taxes. The Persians were good masters, and Cameron emphasises that constantly. 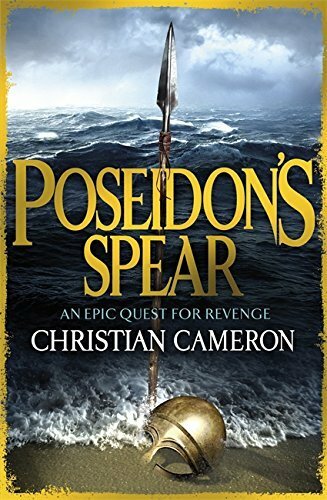 I’d assumed of course that a book about a Greek warrior at the time of Marathon, Salamis and Plataea would demonise the Persians and trot out all the old stereotypes, but Cameron did the exact opposite. Arimnestos warms to these exotic, civilised foreigners who come to visit his well-connected master: particularly the satrap Artaphernes (Darius I’s brother) and three of his bodyguards. Despite their unforgivably effeminate habit of wearing trousers, the Persians can’t do much wrong for Arimnestos: they’re brought up to be courteous, loyal, honest to a fault, and formidable soldiers. But he does find it funny that they’re not remotely interested in boys at all: on the contrary, they’re so susceptible to pretty women that (in a memorable turn of phrase) adultery is pretty much a national sport. It’s the first book I’ve read which has created such a vivid and appealing picture of the society, even if it does leave you with the vague sensation that the Persians spent all their time at war, drinking tea and fighting duels over women. Rather like the 18th century, actually. It was a promising beginning, with a pacy story and attractive characters. But I’m the first to admit that maybe I enjoyed the book for slightly the wrong reasons, and the later instalments didn’t grab me quite so strongly, as you’ll see. The first book contained such a wealth of adventure that even one of the great battles of the ancient world couldn’t quite lift this one to the same level. It begins with Arimnestos home again in Plataea, determined to devote the rest of his days to being a good bronze-smith. Of course that doesn’t happen. His old friend Miltiades runs into trouble in Athens, and so Arimnestos marshals a few of his friends and sets out to see whether he can help. Athens is starting to become an interesting place: Miltiades is just one of several men who have an interest in the city’s political future, and Arimnestos encounters two other figures who hope to turn the Persian crisis to their advantage: Aristides, a supporter of the oligarchic status quo, and the rabble-rouser Themistocles. Having honed his skills as a navarch in Killer of Men, Arimnestos continues his marine education by indulging in a bit of Mediterranean piracy and boosting both his income and his kudos as a leader. With men of his own to follow him, he starts to become an ally worth having. Like Killer of Men, this has some fairly epic battle scenes (as you might imagine from the title), but although I normally enjoy getting my teeth into the clash of bronze, I began to get just a little tired of it here. I think part of the problem was that this book moved away from the character-centred approach of the first novel and, in feeling less engaged by Arimnestos himself, I felt less engaged by the story constructed around him. 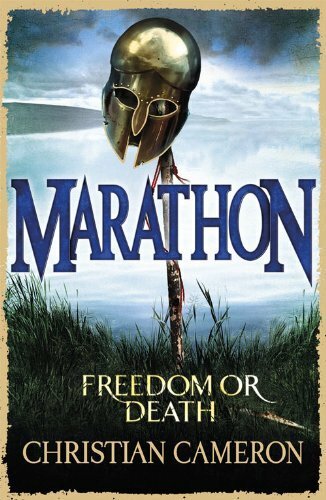 I read the rest of the series primarily to get to this book, in which (due to a complex series of events involving the Olympic Games and Leonidas’ wife Gorgo) Arimnestos finds himself sent as part of a diplomatic mission to Susa. Imagine my gurgling delight! Right into the heart of the Great King’s empire, just in time to meet the new king Xerxes and to witness the first Babylonian Revolt. Result! Despite the less gripping aspects of the previous two books, I felt confident that I was in for something pretty special here. I’ve been to Susa in my own imagination, but there’s something rather exciting about seeing a place through other, better informed eyes, and so I was itching to see what would happen and who we might meet there. It was a bit of a disappointment, I must admit. 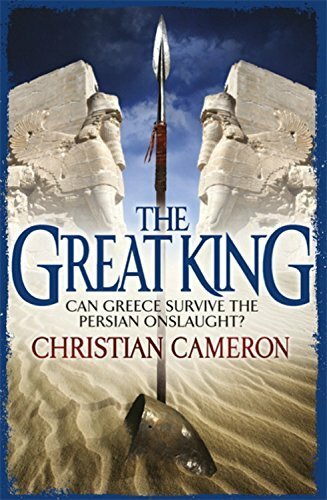 A relatively brief part of the book was spent in Persia and, for someone who’s taken such care to give a balanced and refreshing take on the Persians in general, I felt that Cameron didn’t extend the same attention to Xerxes. In the few pages that we spend with him, Xerxes never develops much beyond Herodotus’ view of him: mercurial; a bit limp; probably not really kingly material; pressured into going to Greece by belligerent advisers like his cousin Mardonius. (That bit was all right: I’ve never liked Mardonius.) But it was a strangely bloodless characterisation. And, although we get to see Xerxes’ mother Atossa in passing, there were a few figures whose absences I mourned. I also, naturally, felt a bit narked that so much effort was spent setting up the Babylonian Revolt, only to have it fizzle out in the background once Arimnestos returns to Greece. Much of that, I know, is down to my own historical obsessions, but even objectively it made for surprisingly unsatisfying reading. When I found myself essentially scan-reading the Battle of Thermopylae at the end of the book, I decided that this was a sign I probably needed to take a bit of a break before joining Arimnestos again. These are perfect books for travel reading: light, full of adventure and peppered with humorous touches and moments of pathos. And the most interesting thing about them is that most of the named characters were real people: Themistocles, Aristides, Miltiades, and even Arimnestos himself. Despite everything I’ve said here, I enjoyed them and I am grateful for Arimnestos’ company during some very long journeys. However, none of the books ever really engaged me emotionally to the extent that, say, Gates of Fire managed. I think part of the problem, for me, was that the series really did start to focus on battles to the exclusion of the genuinely interesting social context of the first book. I’m not averse to the odd battle, but Cameron is a deeply knowledgeable military reenactor and the books show where his enthusiasms lie. His writing makes for some extraordinarily vivid descriptions of what it feels like to fight in a phalanx, run in full panoply or march home exhausted after a battle, but there are also moments where the tactics all started blurring into one, and I found it difficult to remember which naval battle I was in, who we were fighting (and why), and what the date was. Mea culpa. One day I’d like to read Salamis and Plataea – after all, I’m missing some of the best bits – but I think I need a break from battles for the immediate future. > But the problem for me is that all of this feels like a distraction. As a reader, I'm itching to know more about Ionia and Athens and Persia, and it's difficult to suddenly switch all my attention to the North Sea. This is exactly how I feel about the Iceland episode in “To Lie with Lions”! A frequent problem with ‘filler’ books perhaps. And yet I feel bad – I don’t know if you agree? – rather like a fractious child in a classroom who knows she should be listening to the useful and important stuff the teacher’s telling her, but just wants to get outside and play in the sunshine!